We're back! What a month! First we packed up and went to Cross Stitch Market. Then back home for 2 days and we left for 4 days of fun at a retreat in Virginia Beach hosted by Dyeing To Stitch. Home for 2 days and then packed the van for a week of Quilt Market in Houston. Oh the miles I have added to my van! I've been a terrible blogger! There was just no time to update. It really helps to be at home and have time to work on my computer. 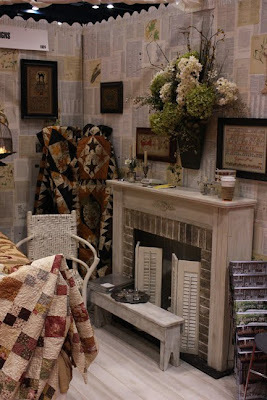 I know you have seen the fireplace at cross stitch market....we have taken it to many shows. It's the perfect "touch of home." A vintage bird cage with twinkle lights adds a chandelier. The quilt on the bed is from our new pattern Wild Pomegranate. The booth is so small....10' x 10'. But we try to pack a lot in this space. Our booth looks so dark this time. It's my fault....I forgot our two spot lights. 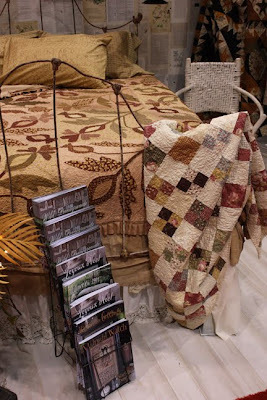 The quilt hanging on the bed frame is made from 2 Garden Party charm packs and a couple of 1/4 yd. pieces of background fabric. Garden Party is the new fabric line shown at this market. The fabric will be in your local quilt shop next spring. This quilt was made from the Garden Party fabric line too. It was designed by Lisa Christensen of Moda fabrics. It will be in our next quilt book published by the Kansas City Star which will be published in spring of 2010 ....right when the fabric will be arriving in your local quilt shop. Thank you Lisa! We love this one. A bit of autumn sparkle to help light our booth. Wish you could have been there. It would have been much more fun with all of you! I did do a bit of shopping for you at market since you couldn't go. Look for a contest instructions on this blog in the next couple of days. I have to make something first before we can have the contest. What a lovely display you created - wish I could have seen it in person. I always enjoy photos of your beautiful displays! 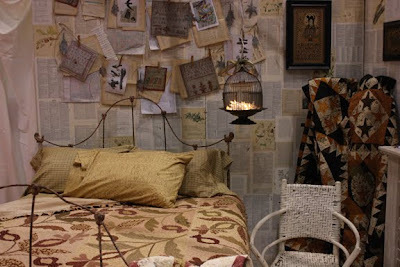 Is the quilt hanging on the bed that you said is made with the Garden Party fabrics also one of your design? If so, what is it called? LOVE the booth! Everything is gorgeous! I love your display :-). Lovely pictures of your lovely display Alma. Wish I could have been there too. Love the pictures of your booth. I got a kick out of the coffee cup on the mantle - I bet you drank a lot of that to keep your energy up!! I just bought your Christmas cross-stitch book and can't wait for your new quilt pattern to come out. Thanks for sharing! I love the quilts! I haven't tried my hand at that yet, but when everytime you show one, I am inspired! 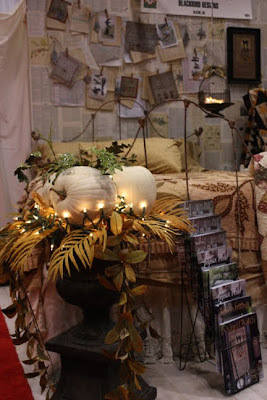 I loved your booth, saw some good pictures on other blogs too!!! Never to many....looks like home to me..so comfy! I really like the colors and feel of your new quilts!! Must be Fall. Rest up, you deserve it! Alma, your booth was always one of my very favorites...oh how I remember our first market...1999...WOW! how the time has flown. I sure miss seeing you all...that's the only bad part of retirement...no more Markets. Oh WOW! Your booth is lovely. I love you quilts you have displayed. Is one of the white pumpkins in the large urn the one you've been toting around for ages? Your booth always looks so fabulous. Love, love, love the white pumpkins..with the lights.Welcome back from a very busy month of traveling. You and Barb are just the best!! I'm always looking forward to your new designs. Quilts, stitching, fabric....you two have the touch!! What a fabulous display! I would sure love to see it in person. Looking forward to your next contest! I cannot wait to get the Pomegranate pattern. It shows so much better in these photos. And the 4-patch (already forgot what you named it but made with charm packs)is fabulous. You guys are amazing! Go Barb! I'm a Beatles fan too! Everything is so lovely. Your booth feels so cozy. It was so much fun visiting with you at Market. You all are the best! Glad to hear you made it back home safe. 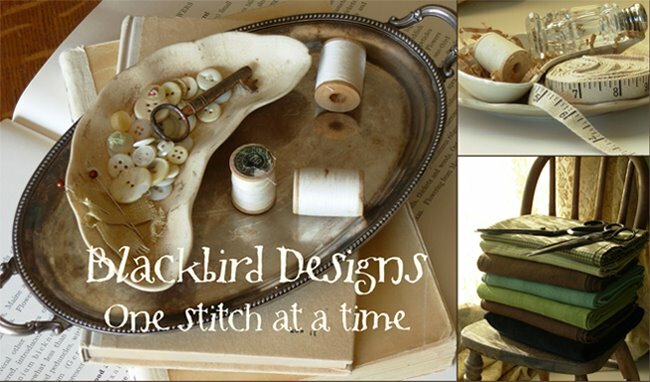 Looking forward to your new fabric and book! Glad to hear you both are back safely! I always enjoy reading your blog. New fabric line Garden Party looks gorgious! Enough time for saving money till spring :)) Welcome back! Awesome display!! love that new Pomagranate quilt!! All the vendors went all out and being in Ontario it is great to see quilt mart even if it is from our chair thanks so much for sharing. I was introduced to your patterns about a year ago and have been buying old and new every since.. You girls are fantastic!! I love your quilts, I'm tempted to learn how to make one just by looking at ours! Thanks for sharing the great pics. Lovely quilts!! I discovered your designs some time ago, I love your cross stitch works too. I come from Barcelona (Spain) and it's very difficult to find your designs, but now I'm waiting for a kit (It's berry time) that I have bought in a online shop, I wish it arrives soon!!! I always enjoy visiting your blog, wonderful photos. Lovely booth and I especially love the book pages as wall paper. Looking forward to the next book! I like your display a lot. It is a lovely way to display your things, so elegantly functional. I thought about you and your white pumpkin yesterday when I saw the featured Home & Garden article in our newspaper. I am including a link to pictures from the article. Please look at the one showing a build-in hutch. I know it is difficult to see here and so much easier when it is a full newspaper page. On the top shelf are little white mounds. Each one is a white pumpkin inside a nest. Under the nests are hosta leaves that have been sprayed with metallic copper paint. Who could go wrong with white pumpkins? 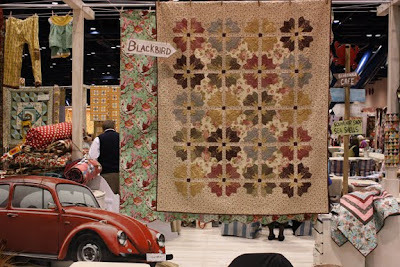 I'm inspired by all the beautiful quilts in your booth! When will the Wildflowers book be released? 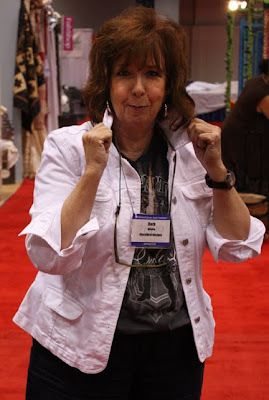 Alma, I traveled a bit with you as my dear friend Kathy took your class in Virginia and had so much fun. Looking forward to your coming to one of our retreats one of these years!! Your display is fabulous. so much like BBGirls! I love your pretty house setting with the gorgeous fireplace. It really lends ambiance :>) The quilts look wonderful and, from your other pictures, all the lovely new things you and Barb created are just waiting to jump into our baskets. I am really excited about the contest. Wonderful display!! Love the new quilts and can't wait for the new book. I was happy that you blogged...I've been going through withdrawal not hearing from you! Kathy in Massachusetts where its definitly fall!! Can you tell us the name of your new book? People seem to be confused between the book name and pattern names. Your patchwork quilt made with Butterfly Garden is so nice...just right for a cold winter night...will this pattern be out soon? I've been searching all over the www and can't get any info yet on any new things except that the new line will be out in Feb. Oh, please let us know about your books! Our friends from the Olde Green Cupboard are in Houston now - Wish I was there with all of you! Your new Wild Pomgranate quilt is awesome - can't wait to see the pattern. I've always wanted to go to market, since my beginning work life started in Retail Management I have always been interested in Design and Marketing and thought that being a buyer and going to market would be great. I appreciate you sharing market from your end. It kind of fulfills the dream I never got to do since I am now a surgical nurse. Glad you are back, I've missed your great blog entries. OOoops....got my designers mixed up ...I meant Garden Party, ...Butterfly Garden is from KTQ. Looking forward to knowing the real name of your book and when it will be available! Love that quilt with the 4-patches. Will be fun to make. I see that the white pumpkin went to Houston too...........with a friend. Can't wait for your new fabric and book. it was great meeting you both at market!! hopefully lisa will be able to wave her magical wand & help us with the super secret quilt project i showed you! !